To call this a catch-up week would be a slight understatement: several of these games have been out for months, with one game reaching European shores after over a year and a half. Enough history, let's get on with it. Sandy Beach (500pts, Konami) – This sandy simulator was released in North America in January 2009 and Japan one year ago, but Europeans can finally enjoy their own indoor beach thanks to Konami. You might want to read our Sandy Beach review to weigh up which is better value for money: this, or a bucket and spade. Chess Challenge! (500pts, Digital Leisure) – Black and white, horses and bishops: it's all here in the thrilling Chess Challenge. You can read our WiiWare Chess Challenge review to mentally prepare yourself, if you like. Aero the Acrobat 2 (800pts, Sunsoft) – Lo and behold, the second outing for the big top bat for Super Nintendo makes its way to the Virtual Console belfry. We'll have a review for you very shortly. Link 'n' Launch (500pts, Nintendo) – Just a six month wait for this one makes it one of the fresher titles available in this week's download. Developed by Intelligent Systems of Advance Wars and Paper Mario fame, this is a puzzle game involving rockets and girders. If that sounds up your street, gaze at the number of stars in our Link 'n' Launch review. Chess Challenge! (500pts, Digital Leisure) – The pocket-sized accompaniment to the WiiWare version, this offers more of the same black-on-white action only in a more portable version. Leaf through our Chess Challenge! review to see if the DSiWare has the advantage over the WiiWare version, or if you should just leave them both alone. Animal Puzzle Adventure (500pts, Aksys Games) – Cramming the DSiWare Holy Trinity of animals, puzzles and adventures into one title – we wish Sudoku were in there too, but nothing's perfect – this download from Aksys tasks you with getting animals into barns. If this one speaks to the budding farmer in you, our Animal Puzzle Adventure review is already out in the fields, chewing the cud and emitting noxious gases. SPACE RACES, SANDY PLACES, ANIMALS, CHESS AND CRIMINAL CHASES! Summer’s here and the Nintendo DSi Shop and Wii Shop Channel have got a selection of scorchers on offer this week, available on Friday 6th August. Whether you’re defending sandcastles from crafty crabs on a Sandy Beach, or flaunting your fighting technique in Aero the Acrobat 2, WiiWare & Virtual Console have got plenty to keep you occupied. For Nintendo DSi enthusiasts, it’s puzzles galore. Whizz around space in Link ‘n’ Launch™, lose yourself in an animal world with Animal Puzzle Adventure, or perfect your chess moves and battle against friends in Chess Challenge! 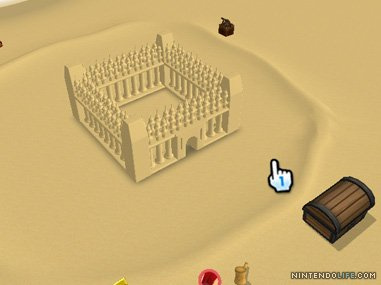 Sandy beach is a fully 3D, sandcastle building game that utilizes the Wii remote to form and detail elaborate sandcastles, images of which can then be captured and saved to your photo gallery. Players can also enjoy co-operative play designing sandcastles on the tranquil shores of Sandy Beach with friends. Watch out for the invading crabs in Crab Battle mode as they storm your sandcastle. You will need to strategically build your sandcastle, before defending it with cannons from the crabs who seek the total destruction of your mighty sand creations. After successfully protecting your castle, use your metal detector to search for hidden treasures to adorn your sandcastle with. You could even unearth additional cannons to aid you in warding off the pesky crabs. Patience is crucial when coming up against the best players from around the world in Chess Challenge! Perfect your chess skills by playing against the computer in multiple difficulty modes, or by using the Nintendo Wi-Fi Connection service to start climbing the worldwide rankings. Win online matches and even see how your chess ratings stack up against the rest of the world by viewing the online leader board. If you don’t have time to play your friends in a live chess game, Chess Challenge! also lets you play with up to five different Wii Friends using WiiConnect24. With full Mii support, you can really bring your games to life! Start off practising on some casual games and work your way up to fully ELO-rated matches. With all of these gameplay options, you have some serious chess action awaiting you - it’s time to pit your wits against the best of the best! Aero the Acrobat bounds back into the spotlight once again to stop the wicked industrialist, Edgar Ektor. Aero enters a new world of excitement and must now use his entire acrobatic prowess to foil a criminal plot known only as, “Plan B!”. Join Aero as he discovers new friends – and enemies – in a world custom-built for his high-flying adventures! With 45 levels of wild acrobatic fun, including: Bonus Rounds, Chance Stages and Hidden Chambers, as well as new villains and original digitalised character voices, you’re guaranteed to be entertained for hours. Furthermore, a password feature now allows you to return to any world, at any time. As if all that wasn’t enough, some new moves, new fighting techniques for Aero’s attacks and the Chillin’ Snowboarding Stage all add a new twist to Aero’s style. Blast off to new heights of fun with a puzzle that is truly out of this world! 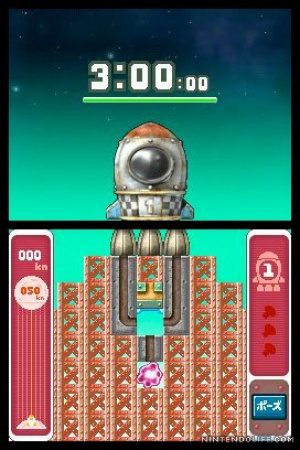 In Link ‘n’ Launch, you must propel a rocket into space by flipping and rotating tiles in order to link fuel to the rocket’s engines. In Mission Mode, you have just three minutes to reach the next planet, quickly linking tiles while keeping your rocket on course. Work your way around unmoveable tiles, plus collect special tiles to upgrade your rocket or grant you additional time. In Puzzle Mode, work out a path that will use up all the fuel and pipe tiles to clear the screen. With 100 puzzles to complete, it’s a challenge of galactic proportions. Animal Puzzle Adventure is a simple puzzle game where you have to lead various animals to their respective barns on the map, while avoiding pitfalls, cliffs and using the objects at hand to your advantage. There are 10 stages per level across a total of 5 levels, providing 50 stages of brain-teasing fun. With so many puzzles to unravel, you’ll find yourself immersed in the puzzle-tastic world of Animal Puzzle Adventure. Plus, after clearing each stage, you will unlock one piece of a photo. Once you clear all 10 stages in a level, the wallpaper for that level will unlock, allowing you to view it in the gallery as an added bonus to this fun-packed game! Nintendo DSiWare - Chess Challenge! In order to score big in Chess Challenge, patience is crucial. Perfect your chess skills by playing against the computer in multiple difficulty modes, or play against your friends in either shared or wireless play via DS Wireless Communication. Start off practising with some casual games and work your way up in fully ELO-rated matches. You’ll even be able to track all of your gameplay statistics – win, lose, or draw! Chess Challenge! will keep both novice and expert players glued to the screen for hours! Another crap update. I hope cave story and last flight come out soon. Nice. Never played Aero 2, but apparently it's not too bad. Will definitely check it out. I've got a points card waiting here, been sitting lonely and unopened for months. At this rate I'll never scratch away the foil-of-joy, but at least it may be worth something as an antique. But there's already a NintendoLife review for Aero the Acro-Bat 2... why review it again? We like to review the VC version when it comes out so we ditched the retro review rather than have two very similar reviews. Don't worry it will be reborn soon! I hope this means Ufouria will be released very soon in the US! Congrats to Europe for getting Aero 2. Great game! Look at our patience - we wait and wait years - but the sail has shipped already, forgotten.